Fireflies, or lightning bugs, aren’t actually flies at all – for that matter, they’re not even really bugs, either. In fact, from a biological standpoint, they’re part of the beetle family. Science aside, these beautiful insects come out once dusk begins in the summertime, and can be seen lighting up the night in many areas of the world. Interestingly, not all fireflies light up. Melissa Breyer of Mother Nature Network says, "California has perfect weather, palm trees, and stellar food. But alas, it doesn’t have fireflies. Actually, let us restate that: it doesn’t have fireflies that light up. Of the more than 2,000 species of fireflies, only some come equipped with the ability to glow; the ones that are able to don’t generally live in the West." Regardless, there’s an ethereal quality to fireflies, silently moving around, blinking like beacons in the dark. Let’s look at some of the folklore, myths, and magic associated with fireflies. In China, long ago, it was believed that fireflies were a product of burning grasses. Ancient Chinese manuscripts hint that a popular summer pastime was to catch fireflies and put them in a transparent box, to use as a lantern, much like children (and adults) often do today. Even though fireflies put on a pretty great light show, it’s not just for entertainment. The flashing of their light is how they communicate with each other – especially for courtship rituals. Males flash to let the ladies know they’re looking for love… and the females respond with flashes to say they’re interested. Fireflies appear in a lot of Native American folklore as well. There’s an Apache legend in which the trickster Fox tries to steal fire from the firefly village. To accomplish this, he fools them and manages to set his own tail on fire with a piece of burning bark. As he escapes the firefly village, he gives the bark to Hawk, who flies off, scattering embers around the world, which is how fire came to the Apache people. As punishment for his deception, the fireflies told Fox that he would never be able to use fire himself. The scientific name for the compound that helps fireflies light up is luciferin, which comes from the Latin word Lucifer, meaning light-bearing. The Roman goddess Diana is sometimes known as Diana Lucifera, thanks to her association with the light of the full moon. There was a Victorian tradition that if a firefly or lightning bug got into your house, someone was going to die soon. Of course, the Victorians were pretty big on death superstitions, and practically turned mourning into an art form, so don’t panic too much if you find a firefly in your home some warm summer evening. Want to know something else that’s pretty cool about fireflies? In only two places in the entire world, there’s a phenomenon known as simultaneous bioluminescence. That means that all the fireflies in the area sync up their flashes, so all they light up at exactly the same time, repeatedly, all night long. The only places you can actually see this happen are Southeast Asia and the Great Smoky Mountains National Park. Think about the different aspects of firefly folklore. How can you use them in a magical working? Feeling lost? Catch some fireflies in a jar (please, poke holes in the lid!) and ask them to illuminate your way. Release them when you’re done. Use fireflies to represent the element of fire on your summer altar. Fireflies are sometimes associated with the moon – use them in summer moon rituals. 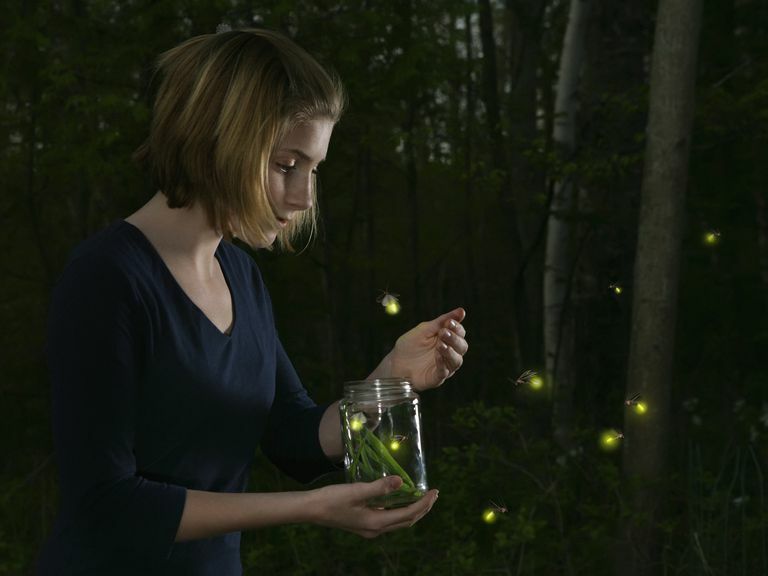 Incorporate firefly light into a ritual to attract a new mate, and see who responds. Some people associate fireflies with the Fae – if you practice any sort of Faerie magic, welcome the fireflies into your celebrations. Incorporate firefly symbolism into a ritual to honor your ancestors.